Although we likely don't notice people wearing dentures in everyday interactions, approximately 20 million Americans ages 18 to 74 wear some sort of dentures. 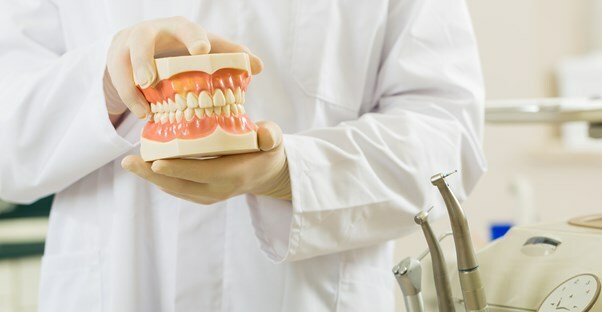 If you’ve been told you may need dentures but are uncertain of whether you want full or partial dentures, here is some information you may find very helpful. Full and partial dentures are similar in that they both are referred to as false teeth, are used to replace natural teeth that are missing and are removable. They both also require a period of adjustment. Full and partial dentures are different in that full dentures provide you with a full set of false teeth for both the bottom and top. Partials, on the other hand, are used when you still have one or more of your own teeth. Partials generally have metal clasps that wrap around a couple of your natural teeth for more support. Because of this extra support, many people hang on to their natural teeth as long as possible to avoid having to wear full dentures. Deciding on whether to get full or partial dentures can be a tough choice, especially if you have the option of going either way. Here are some pros and cons of full dentures. No fear of cavities in remaining teeth. They don’t have the stability in your mouth that’s found with partials. Lower dentures are more difficult to adapt to and keep in place than partial dentures. They tend to slip around unless you use adhesive and dental creams. If you’re steering in the direction of partial dentures, perhaps this list of pros and cons will be helpful. Lower dentures are easier to adapt to. Depending on the material, additional false teeth can be added to partials. Natural teeth left require extra care to avoid decay from metal clasps. If you lose another natural tooth, you may need to get a new partial. Excessive pressure from the partial moving may cause trauma to the natural teeth or gums. The cost for both partial and full dentures can vary by different factors, such material they're made of and the dentist you use. Dentures made of resin are typically more expensive than acrylic dentures. If the patient chooses a few dental implants to assist in keeping the dentures intact, this can add greatly to the cost of the dentures. All factors aside, partial dentures are usually cheaper than full dentures because there are fewer teeth involved, and they require less work and materials. If you are uncertain as to which path you want to go regarding dentures, speak with your dentist. He or she can answer any of your questions and advise you as to the best way towards a happy and healthy smile.